Stefan McFarland left an 11-year career as an Armor Officer in the United States Army to pursue his lifelong dream of working in the medical field. He graduated from the United States Military Academy at West Point and received his Master of Physician Assistant Studies at the University of Florida College of Medicine in 2014. Shortly after graduation he began working with his family doctor, Dr. Richard Male, in Georgetown, Texas. McFarland also shadowed Dr. Male before going to pursue his Physician Assistant studies. After three years in family medicine, McFarland began working at Metroplex Emergency Room in Killeen, Texas. In both settings he was routinely exposed to those suffering from allergies and asthma and sought a better way to help them relieve their symptoms. 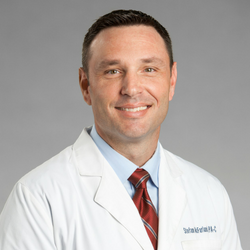 A sufferer of seasonal allergies himself, McFarland chose to join the Texan Allergy & Sinus Center Team for the opportunity to provide excellent care to those suffering from environmental, food, and sinus problems. A native Texan and resident of Central Texas since 2004, Stefan enjoys outdoor activities, sports, and spending time with his wife and four children.